One of the best pieces of advice about finding award space that I could offer is – find the most difficult leg of the itinerary, and work from there. There are a lot of tools available online that can help in finding award space, but not all of them are robust enough to think of weird permutations – like flying to Tokyo via Frankfurt from the US (a perfectly enjoyable route, just a little longer). One of the tools I use for this, I actually picked up from a Million Mile Secrets post I saw more than two years ago. That tool is OpenFlights.org. Essentially, the tool identifies airline routes that connect the particular airport you’re looking for. I primarily use OpenFlights.org when I’m looking for airline linkages to a particular place I’d like to visit. The starting display gives you a world map, and some sorting functionality on the side (more on that in a bit). To use a short example, lets say I want to go to the Seychelles – here’s what I get when I put in SEZ – the airport code for Mahe, The Seychelles. OpenFlight.org data for airports connected to the Seychelles. Routes operated to the Seychelles (courtesy of www.gcmap.com). OpenFlight.org detail of flights to The Seychelles. 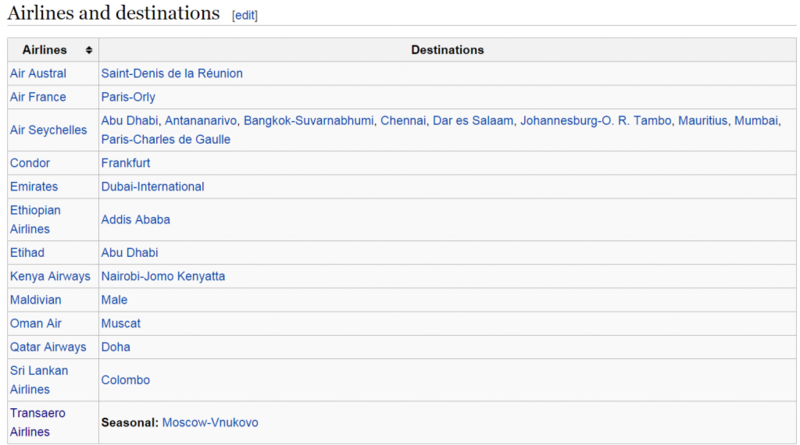 Airlines that serve Mahe, The Seychelles (SEZ) and destinations they link, via Wikipedia. There are some inconsistencies between the data, and candidly, I trust OpenFlights.org more. From some further research, I know that Qatar Airways suspended their flight in June 2013. Ok, so hopefully we agree, you won’t be flying Alitalia to the Seychelles (for now at least). Boiling it down to the “commonly available” award redemptions, I’d limit it to: Etihad Airways (via American Airlines miles), Sri Lankan (via Oneworld), Emirates (via Alaska Airlines miles), South African Airways (via Star Alliance), Kenya Airways (via Sky Team). For popular destinations, its probably not necessary to use OpenFlights.org, unless you’re looking for Fifth Freedom flights or if you’re looking to fly a particular airline (in which case you’d search for your origin). That said, the tool is really helpful for some of the more remote or exotic destinations that are not served by as many airports. Have you used OpenFlights.org? Or are there destinations on your bucket list where this would be helpful? Great post, I’m gonna fool around with OpenFlights when I get time, I usually just use Wikipedia. I always wanted to take Jess to Seychelles but lost the ability to do it via Skyteam right around when we were going to have enough miles to go (went Bora Bora instead). Looks like Qatar could be a good option thru doha too! @Joe – so, Qatar cancelled their flight to the Seychelles in 2013… I don’t know if they’re re-starting it. There are still a good number of options of ways to get there… like if you’re going to use AA miles, you could fly Etihad (90k for First Class, but be aware, I think they only operate business from AUH-SEZ).